Effective central tolerance is required to control the large extent of autoreactivity normally present in the developing B cell repertoire. Insulin-reactive B cells are required for type 1 diabetes in the NOD mouse, because engineered mice lacking this population are protected from disease. The Cg-Tg(Igh-6/Igh-V125)2Jwt/JwtJ (VH125Tg) model is used to define this population, which is found with increased frequency in the periphery of NOD mice versus nonautoimmune C57BL/6 VH125Tg mice; however, the ontogeny of this disparity is unknown. To better understand the origins of these pernicious B cells, anti-insulin B cells were tracked during development in the polyclonal repertoire of VH125Tg mice. An increased proportion of insulin-binding B cells is apparent in NOD mice at the earliest point of Ag commitment in the bone marrow. Two predominant L chains were identified in B cells that bind heterologous insulin. Interestingly, Vκ4-57-1 polymorphisms that confer a CDR3 Pro-Pro motif enhance self-reactivity in VH125Tg/NOD mice. Despite binding circulating autoantigen in vivo, anti-insulin B cells transition from the parenchyma to the sinusoids in the bone marrow of NOD mice and enter the periphery unimpeded. Anti-insulin B cells expand at the site of autoimmune attack in the pancreas and correlate with increased numbers of IFN-γ–producing cells in the repertoire. These data identify the failure to cull autoreactive B cells in the bone marrow as the primary source of anti-insulin B cells in NOD mice and suggest that dysregulation of central tolerance permits their escape into the periphery to promote disease. Central tolerance is a critical barrier for the development of autoreactive B lymphocytes. Dangerous self-specificities are seeded into the peripheral B lymphocyte repertoire to promote several autoimmune diseases, suggesting defective central tolerance (1–4). A better understanding of how and why central tolerance fails is necessary to enhance treatment modalities for complex autoimmune disorders. A key goal is to correct the underlying immune defects in these patients, rather than only managing symptoms after the destruction has run its course. Developmental checkpoints exist in the bone marrow (BM) that revise BCR autoreactivity or limit BM egress and maturational progression. Ag availability and BCR interaction strength control whether and how developing B cells are censored. Receptor editing is the primary mechanism through which autoreactivity is removed from the developing repertoire; if receptor editing fails, deletion may ensue (5). Developing B cells migrate from the BM parenchyma into the BM sinusoids as they mature and prepare for egress into the blood (6). Autoreactive B cells that undergo receptor editing show impaired transition from the BM parenchyma into the sinusoids (7). Furthermore, loss of cannabinoid receptor 2, required for sinusoidal retention, reduces the frequency of λ+ B cells in the periphery, consistent with the hypothesis that limiting the window of time in the BM reduces receptor editing (6). These data highlight the transition between these anatomical niches as a key central tolerance checkpoint. The NOD mouse model develops type 1 diabetes (T1D) spontaneously, and it mirrors many aspects of human disease. Insulin autoantibodies are predictive of T1D development in both mice and humans (8–10), suggesting that breaches in B lymphocyte tolerance occur. Insulin is a critical T1D autoantigen; limiting insulin recognition by either the T cell (11) or B cell (12) repertoires is protective against disease development in NOD mice. To better understand how autoreactive B cells are censored differently in the context of autoimmune disease, anti-insulin B cell development was investigated in NOD mice. Despite the clear presence of insulin autoantibodies in wild-type (WT)/NOD mice, anti-insulin B cells are difficult to reliably track in the mature WT/NOD repertoire (13). The Cg-Tg(Igh-6/Igh-V125)2Jwt/JwtJ (VH125Tg) model harbors an anti-insulin H chain that pairs with endogenous L chains. This model permits clear tracking of this important specificity within the context of a polyclonal repertoire (12). Thus, this approach preserves competition of autoreactive B cells with nonautoreactive B cells for survival factors, follicular entry, and other biological aspects known to impact how central tolerance is imposed (14, 15). Previous studies demonstrated that, although anti-insulin B cells are readily observed in the mature repertoire of VH125Tg/NOD mice, this specificity is reduced or absent in the mature repertoire of nonautoimmune VH125Tg/C57BL/6 (B6) mice, despite restricted usage of the same anti-insulin H chain (13, 16). The ontogeny of this disparity is unknown, but it could contain clues about how similar tolerance defects may promote autoimmune disease in humans. Using the VH125Tg model, we show that anti-insulin B cells form with increased frequency in BM of the autoimmune-prone NOD strain compared with the nonautoimmune B6 strain. This disparity is first evident among immature B cells present in the BM sinusoids, after they have transitioned from the parenchyma. BM culture also enhanced anti-insulin B cell formation in vitro, suggesting that extrinsic factors that might be unique to the autoimmune environment in vivo do not entirely account for this difference. Germline Vκ polymorphisms that confer the potential for generation of a Pro-Pro motif in CDR3 enhance the autoreactivity of the NOD insulin-binding L chain, Vκ4-57-1. In addition, negative selection of anti-insulin BCRs is not evident in VH125Tg/NOD mice, despite insulin encounter at the earliest stages of anti-insulin B cell development. Once this central tolerance defect seeds anti-insulin B cells into the mature repertoire, anti-insulin B cells are further enriched at the site of autoimmune attack in the pancreas. The presence of anti-insulin B cells in the repertoire is associated with an increased frequency of cells that produce IFN-γ, presumably insulin-reactive T cells. These data demonstrate that “original sin” against the insulin autoantigen is traced to enhanced BM production of anti-insulin B cells. The failure of central tolerance to cull this key autoimmune specificity from the developing B cell repertoire ultimately allows critical APCs to facilitate islet autoreactivity. The anti-insulin VH125Tg [Cg-Tg(Igh-6/Igh-V125)2Jwt/JwtJ] and noninsulin-binding VH281Tg [Tg(Igh-6/Igh-V281)3Jwt/JwtJ] (The Jackson Laboratory) H chain transgenic (Tg) mice used in this study harbor a randomly integrated H chain Ig Tg (VH) on the B6 or NOD background, as described previously (12, 17). Age ranges are indicated in the figure legends. All data are derived from lines that have been backcrossed for >20 generations to B6 or NOD mice, which are hemizygous for all Tg indicated. All mice were housed under sterile conditions, and all studies were approved by the Institutional Animal Care and Use Committee of Vanderbilt University, which is fully accredited by the American Association for the Accreditation of Laboratory Animal Care. BM was eluted from femurs, tibias, and humeri with HBSS (Invitrogen) + 10% FBS (HyClone). RBCs were lysed using Tris-NH4Cl, and cells were used for flow cytometry analysis or resuspended at 2 × 106 cells/ml in complete culture medium (DMEM, 10% FBS, l-glutamine, HEPES, MEM sodium pyruvate, nonessential amino acids, gentamicin, 2 × 105 M 2-ME, and 15 ng/ml human rIL-7 [PeproTech]) and cultured for 5 d in a 37°C CO2 incubator (all from Invitrogen unless otherwise specified). FBS contains fg/ml amounts of bovine insulin, which is below the threshold necessary to induce any B cell responsiveness in all assays tested. To remove IL-7, 5-d cultures were washed with HBSS + 10% FBS and resuspended at 2 × 106 cells/ml in culture media without IL-7 and grown for an additional 2 d, at which point cells were harvested and stained for flow cytometry analysis. Spleens were harvested and macerated, and RBCs were lysed. Freshly isolated pancreata were digested with 3 ml 1 mg/ml collagenase P diluted in HBSS at 37°C for 30 min and then tissue was disrupted using an 18G needle. HBSS + 10% FBS was added immediately to inhibit collagenase activity. Cells were resuspended and used for flow cytometry analysis. Flow cytometry analysis was performed using an LSR II (BD Biosciences). Ab reagents reactive with B220 (6B2), IgMa (DS-1), IgMb (AF6-78), CD4 (RM4-5), CD19 (1D3), CD21 (7G6), CD23 (B3B4) (BD Biosciences), or IgM (μ-chain specific; Invitrogen), or 7-aminoactinomycin D, or DAPI were used for flow cytometry. Human insulin (Sigma-Aldrich) was biotinylated at pH 8 in bicine buffer using biotin N-hydroxysuccinimide ester (Sigma-Aldrich) and detected with fluorochrome-labeled streptavidin (BD Biosciences). Insulin-specific B cells were confirmed among B220+ IgM+ live lymphocytes by competitive inhibition with 10-fold excess unlabeled insulin, as well as a linear relationship of insulin-binding and IgMa expression. The percentage of insulin-specific B cells was calculated by subtracting the percentage of insulin-binding B cells in the presence of 10× inhibition with unlabeled insulin competitor (e.g., Fig. 1B, right panels) from the percentage of insulin-binding B cells in the absence of unlabeled insulin competitor (e.g., Fig. 1B, left panels) to include only Ag-specific B cells in computational analyses. BCR occupancy with endogenous insulin was detected using a second anti-insulin Ab, mAb123 (10–20 μg/ml), which was biotinylated. Preincubation with Fc Block (2.4G2; BD Biosciences) did not impact the frequency of insulin-binding B cells (multiple experiments; data not shown). mAb123 binds a distinct insulin epitope from mAb125 (from which VH125Tg is derived), and it has been used successfully to detect 125Tg BCR occupancy with endogenous insulin (17). These mAbs do not recognize insulin bound to the hormone receptor (18). FlowJo (TreeStar) software was used for analysis. VH125Tg/NOD or VH125Tg/B6 mice were immunized with human or porcine insulin covalently conjugated to Brucella abortus ring test Ag (U.S. Department of Agriculture, Ames, IA) using insulin acylated with m-maleimidobenzoyl-N-hydroxysuccinimide ester (Pierce Chemical, Rockville, IL) and B. abortus thiolated with methyl-4-mercaptobutyrimidate (Pierce Chemical) (19). This approach was shown to interrogate the germline repertoire for anti-insulin B cells in BALB/c mice (19–22). Splenocytes were harvested after 3–5 d and used in a standard fusion protocol (19) with the mouse myeloma line NSO or to facilitate capture of autoreactive B cells, NSO-BCL2 line (a gift from Dr. Betty Diamond, Feinstein Institute, Manhasset, NY), as fusion partners (23). Hybridomas were selected in hypoxanthine-aminopterin-TdR (Sigma-Aldrich)-supplemented hybridoma medium (DMEM, 10% FBS, l-glutamine, HEPES, MEM sodium pyruvate, penicillin/streptomycin, 2 × 10−5 M 2-ME, and NCTC-109; Invitrogen), and production of anti-insulin Ab was verified through ELISA, as described previously (19). RNA was purified from expanded clones, and Vκ genes were amplified and sequenced as described below. Rows of the same 96-well plate were coated with either 1 μg/ml human (Sigma-Aldrich) or rodent (Novo, Bagsvaerd, Denmark) insulin and then incubated with parallel hybridoma supernatant samples in duplicate. Anti-insulin IgMa Ab was measured as described previously (19), and wells were monitored for a human insulin with OD ∼1.0 to normalize for differences in total Ab levels among hybridoma supernatants. To assess the level of self-reactivity of hybridoma clones with rodent insulin, the “autoreactivity index” was calculated by dividing the average rodent insulin OD by the average human insulin OD read at the same time point on the same plate. A value of 0 indicates no self-reactivity, whereas a value of 1 indicates comparable reactivity for both rodent and human insulin. ELISA duplicates were very precise (data not shown). BM cells were cultured for 5 d with IL-7 (as described above) to enrich for naive developing B cells. Splenocytes were enriched for B cells by CD43+ cell depletion using anti-CD43 magnetic beads through magnetic sorting (Miltenyi). Developing (BM) or peripheral (spleen) B cells from five mice (8–12 wk of age) were incubated with anti-B220, anti-IgMa, DAPI, and biotinylated insulin/streptavidin, and insulin-binding B cells were purified using a FACSAria I or II cell sorter. RNA was isolated from flow cytometry–sorted insulin-binding B cells using an Ambion RNAqueous-Micro kit or from insulin-binding hybridoma cell lines using an Ambion RNAqueous kit (Applied Biosystems). First-strand cDNA was generated from total RNA using Superscript II RT (Invitrogen) and 0.67 μg oligo-dT primer (GE Healthcare) in a standard protocol. Vκ sequences were amplified from first-strand cDNA using the following primers: murine Cκ primer, 5′−GGA TAC AGT TGG TGC AGC ATC-3′ and murine VκA, 5′−ATT GTK MTS ACM CAR TCT CCA-3′, where K = G or T, M = A or C, S = C or G, and R = A or G. Vκ sequences were amplified, cloned, and sequenced as described previously (16, 24). Vκ gene segment sequence alignments (excluding sequence provided by the degenerate 5′ primer) were assigned using the ImMunoGeneTics (IMGT) database (http://www.imgt.cines.fr:8104/) and IgBLAST (http://www.ncbi.nlm.nih.gov/igblast/). Individual clones are each derived from independent pools of RNA, and accession numbers are provided in the legends for Figs. 2, 4, and 5. Mice were injected i.v. with 1 μg anti–CD19-PE (1D3; BD Biosciences) and sacrificed after 2 min. BM was immediately eluted from femurs, tibias, and humeri, and cells were isolated as above. Cells were stained with Abs reactive with cell surface markers, including anti–CD19-allophycocyanin, to aid in the detection of sinusoidal (CD19-PEhi, CD19-allophycocyaninlow) versus parenchymal (CD19-PElow, CD19-allophycocyaninhi) cells using flow cytometry, as described above. Specific labeling of B cells present in these anatomical niches using this method was reported previously (6). Ninety-six–well multiscreen filter plates (Millipore) were prewet with 70% methanol, washed with sterile 1× PBS (no Mg2+ or Ca2+), coated with 10 μg/ml unlabeled anti-mouse IFN-γ (14-7313-85; eBioscience) in 1× PBS, and incubated overnight at 4°C in the dark. Plates were washed with 1× PBS and blocked with complete RPMI culture medium (RPMI 1640 [Cellgro] containing 10% FBS, 1% l-glutamine, 1% HEPES, 0.2% gentamicin, and 0.1% 2-ME; Life Technologies) for 1 h at room temperature (RT). Splenocytes from VH281Tg/NOD and VH125Tg/NOD female mice were isolated and plated at 5 × 105 cells/well, with or without 100 μg/ml human insulin (Sigma-Aldrich), or with 5 μg/ml anti-mouse CD3 (hybridoma 2C11; American Type Culture Collection) as positive control and incubated for 72–96 h at 37°C in a CO2 incubator. Plates were washed with 1× PBS and then with wash buffer (1× PBS/1% FBS/0.05% Tween-20), coated with 2 μg/ml biotinylated anti-mouse IFN-γ (13-7312-85; eBioscience) in 1× PBS/0.5% FBS, and rocked for 3 h at RT. Plates were washed with wash buffer, rocked with avidin peroxidase complex (PK-6100; VECTASTAIN) prepared in wash buffer for 1 h at RT, and washed with wash buffer, followed by 1× PBS. Thirty percent H2O2 was added immediately before coating the plate with one 3-amino-9-ethyl-carbazole (205-057-7; Sigma-Aldrich) tablet dissolved in 2.5 ml di-methyl formamide and mixed with 0.1 M acetate buffer, which was incubated for 10–15 min at RT. Cold tap water was used to stop the reaction, and dry plates were read on an ImmunoSpot plate reader (Cellular Technology Limited). Data are expressed as the average of technical triplicates of the number of spots/well/104 CD4+ T cells (calculated using total cell count and CD4+ live lymphocyte frequency identified using flow cytometry). An increased frequency of insulin-binding B cells is found in the mature B cell repertoire of NOD mice, despite identical H chain transgenes that provide similar potential to generate anti-insulin B cells in both B6 and NOD strains (13). The small population of anti-insulin B cells present in the mature VH125Tg/NOD B cell repertoire is sufficient to promote T1D (12, 25). To identify the ontogeny of this disparity and uncover where tolerance defects arise, high-throughput flow cytometry was used to investigate these populations in the BM. Insulin autoantibodies are harbingers of disease in WT/NOD mice (9); however, anti-insulin B cells are difficult to detect in the BM (Fig. 1). This issue was circumvented by the use of the VH125Tg model, in which a small, but reproducible, population of insulin-specific B cells (calculated as described in Materials and Methods) was detected among B6 and NOD VH125Tg immature B cells (B220mid IgMa+ live lymphocytes) in the BM (Fig. 1A). This population is not observed in VH281Tg mice (12), confirming Ag specificity in VH125Tg mice. Of note, the percentage of insulin-specific immature B cells observed was increased significantly (∼3–4-fold) in the BM of VH125Tg/NOD mice (0.32 ± 0.17) compared with VH125Tg/B6 mice (0.08 ± 0.14, p < 0.001) (Fig. 1A). Contamination of CD23+ mature recirculating B cells in the B220mid IgM+ gate is minimal; similar results are observed when immature B cells are defined as B220+ IgM+ CD23− (data not shown). These data show that the VH125Tg model can be used to track the otherwise rare population of anti-insulin B cells as they navigate tolerance hurdles during development. Furthermore, these data suggest that the autoimmune strain enhances formation of anti-insulin B cells, despite H chain repertoire restriction. Increased formation of anti-insulin B cells initiates in the BM of T1D-prone VH125Tg/NOD mice. (A) Freshly isolated BM from B6 or NOD VH Tg (anti-insulin VH125 or noninsulin-binding VH281) or WT mice was phenotyped using high-throughput flow cytometry analysis. Cells were gated on B220mid IgMa+ live lymphocytes to show immature B cells. Parallel samples were incubated with 10-fold excess unlabeled insulin to demonstrate a specific interaction of the BCR with insulin; specific insulin binding was calculated as described in Materials and Methods. Results for individual 5–19-wk-old mice are plotted (n ≥ 7 mice, n ≥ 4 experiments). (B and C) BM from B6 or NOD VH Tg animals (anti-insulin VH125 or noninsulin-binding VH281) were cultured with IL-7 for 5 d to enrich for Ag-naive B cells. IL-7 was withdrawn, and cells were cultured in the absence of exogenous insulin for an additional 2 d. (B) The frequency of insulin-specific B cells was determined as above; representative flow cytometry plots are shown. (C) Results from individual mice are plotted: B6 (black), NOD (white), VH125Tg (diamonds), and VH281Tg (circles) (n ≥ 6 5–19-wk-old mice, n ≥ 4 experiments). *p < 0.01, **p < 0.001, two-tailed t test. IL-7–driven BM culture generates Ag-naive immature (IgM+ CD23−) B cells in vitro (26, 27); thus, it provides a useful tool to eliminate tolerance induced by circulating insulin, as well as other environmental influences present in vivo, which may differentially shape autoreactive B cell development within the two strains. Therefore, B6 or NOD VH125Tg BM was cultured with IL-7 in vitro in the absence of insulin to investigate the generation of anti-insulin immature B cells. Flow cytometry analysis of live B220+ IgMa+ VH125Tg/NOD BM cultured with IL-7 showed a nearly 10-fold increased percentage of insulin-binding B cells (0.66 ± 0.29) compared with VH125Tg/B6 BM (0.07 ± 0.06, p < 0.001) (Fig. 1B, summarized in Fig. 1C). VH125Tg/B6 mice showed a significantly increased percentage of insulin-binding B cells compared with negative-control VH281Tg/B6 mice (p < 0.01). 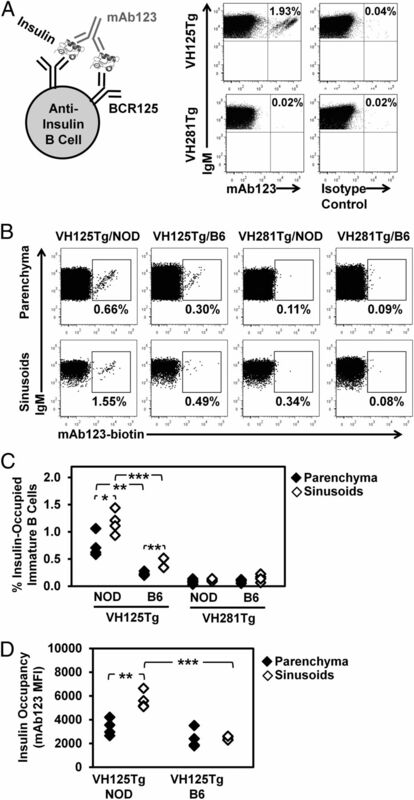 This demonstrates that enhanced formation of insulin-binding B cells in the developing VH125Tg/NOD BM repertoire occurs independently of the in vivo environment, in which circulating insulin exposure occurs. Immature B cells migrate from the BM parenchyma into the blood-exposed sinusoids as they mature and prepare for emigration to the periphery; they are subject to tolerance checkpoints at these transitions (6, 28). To investigate the developmental stage at which an increased frequency of anti-insulin B cells is first apparent in the NOD strain, in vivo labeling with anti-CD19, as described in Materials and Methods, was used to identify immature B cells (B220+ IgM+ CD23− lymphocytes) within the parenchyma and sinusoids in the BM. Insulin-binding immature B cells are present in both parenchyma (0.52 ± 0.11) and sinusoids (0.71 ± 0.13) of VH125Tg/B6 mice, as well as in the parenchyma (0.59 ± 0.10) and sinusoids (1.06 ± 0.21) of VH125Tg/NOD mice (Fig. 2A, 2B). These data suggest that anti-insulin B cells are not counterselected during the transition of immature B cells from the parenchyma into the sinusoids in either VH125Tg/B6 or VH125Tg/NOD mice. Furthermore, the increased frequency of insulin-binding B cells within the NOD strain is first significantly apparent in immature B cells that have reached the sinusoids (p < 0.001). The increase in anti-insulin B cell frequency is first apparent in the BM sinusoids of VH125Tg/NOD mice that harbor polymorphic anti-insulin Vκ4 genes that alter CDR composition. (A and B) Flow cytometry was used to identify live, B220mid IgMa+ lymphocytes (immature B cells) in freshly isolated B6 or NOD VH125Tg BM that had been labeled to detect parenchymal (CD19-PElow) and sinusoidal (CD19-PEhigh) B cells, as described in Materials and Methods. Insulin-binding B cells were detected with biotinylated human insulin. (A) Representative flow cytometry plots depicting the frequency of insulin-binding B cells. (B) Summary graph (n ≥ 9 5–13-wk-old mice, n = 3 experiments). *p < 0.01, **p < 0.001, two-tailed t test. (C) Flow cytometry sorting was used to isolate insulin-binding immature B cells (B220+ IgMa+ CD23− lymphocytes) identified with biotin-insulin from freshly isolated BM (n = 6 VH125Tg/NOD mice, n = 2 experiments, n = 15 clones, KC484537-KC484551; n = 15 VH125Tg/B6 mice, n = 2 experiments, n = 10 clones, KC484552-KC484561). Mice were 6–17 wk old. Expressed Vκ genes were cloned, sequenced, and identified using IMGT and IgBLAST, as described in Materials and Methods. Vκ usage is shown. For each Vκ isolated, the total number of clones is shown within the pie chart; frequency is shown outside the pie chart. Sequences were deposited into GenBank under the accession numbers indicated. (D) Comparison of CDR composition of insulin-binding Vκ4 genes identified in (C), amino acid polymorphisms are underlined, relative to B6. Sequences are deposited in Genbank as AC158673, AJ231217, GU179059, and GU179060. B6 and NOD VH125Tg mice, which express identical anti-insulin H chains, should possess the same potential to generate insulin-binding B cells; however, the observed frequency is disparate (Figs. 1, 2A, 2B). To identify whether Vκ differences are found in the insulin-binding repertoire of VH125Tg B6 and NOD mice, flow cytometry sorting was used to purify insulin-binding immature B cells from freshly isolated BM. Degenerate PCR primers were used to amplify Vκ genes from cDNA that were cloned, sequenced, and analyzed as described in Materials and Methods. Fig. 2C shows that ∼70% of the insulin-binding repertoire of VH125Tg B6 and NOD mice consists of two Vκ4 genes, Vκ4-57-1 and Vκ4-74. CDR comparisons between these genes show germline polymorphisms (underlined) present in the NOD strain (Fig. 2D), consistent with previously published data identifying germline polymorphisms in many NOD Vκ sequences (24). Because of the polymorphic nature of NOD Vκ, a definitive assignment of specific Vκ identity was not previously possible based on sequence homology alone: NOD Vκ4-74 and Vκ4-57-1 each shared similar homology with the corresponding germline sequences (24). The Wellcome Trust Sanger Institute is sequencing the genomes of several strains of mice, including NOD. The Mouse Genomes Project online tool LookSeq was used to compare polymorphisms determined by Wellcome Trust Sanger Institute sequencing of the NOD genome that mapped to the Vκ4-74 region with those experimentally determined for NOD “Vκ4-74” identified in these and prior studies. The current level of coverage is sufficient to show a high degree of agreement between polymorphisms, suggesting that the Vκ4-74 designation is correct and that the nucleotide differences are germline encoded. Sequence coverage in the Vκ4-57-1 region was less robust; however, after ruling out Vκ4-74 as its homolog, it is sufficiently dissimilar to other potential Vκ4 that an alternative identity is unlikely. These data show that two polymorphic Vκ4 genes with altered CDR composition dominate the insulin-binding repertoire in the BM of VH125Tg/NOD mice. Polymorphic changes in NOD Vκ CDR might alter autoantigen binding. The anti-insulin Ab, mAb123, recognizes a separate insulin epitope from VH125 and can be used to identify B cells whose BCRs are occupied by endogenous insulin (13, 17). To investigate the anatomical niche in which the insulin autoantigen is first encountered, as well as whether it is differentially recognized by VH125Tg B6 and NOD mice, in vivo labeling with anti-CD19 was used to identify parenchymal and sinusoidal immature B cells in VH125Tg NOD and B6 mice as in Fig. 2. The in vivo labeling was combined with mAb123-biotin staining and flow cytometry to enumerate the frequency of insulin-binding B cells whose BCRs were endogenously occupied with insulin in these anatomical niches. Fig. 3A demonstrates that mAb123 staining is specific; the insulin-binding population identified by mAb123 is not observed with isotype-control staining (top right panel) or in VH281Tg mice that harbor a similar H chain but lack insulin-binding B cells (bottom left panel) (12). As shown in Fig. 3B and 3C, BM B cells are clearly stained with mAb123-biotin in both parenchyma (0.74 ± 0.22) and sinusoids (1.17 ± 0.21) of VH125Tg/NOD mice, whereas smaller insulin-occupied populations are observed in the parenchyma (0.23 ± 0.03) and sinusoids (0.43 ± 0.10) of VH125Tg/B6 mice. As expected, insulin-occupied B cells are not detected in VH281Tg B6 or NOD mice, confirming mAb123 specificity. The frequencies of mAb123+ B cells detected in VH125Tg mice are significantly higher than are the comparative VH281Tg populations, regardless of strain or anatomical niche (p < 0.001). In addition, the frequency of insulin-occupied immature B cells is significantly increased in the sinusoids of VH125Tg mice. The BM parenchyma is the initial site of endogenous insulin encounter, whereas higher insulin occupancy of the BCR occurs in the sinusoids of VH125Tg/NOD mice. (A) Schematic diagram of mAb123 recognition of insulin-occupied BCR (left panel). Representative flow cytometry plots for insulin-binding (VH125Tg, n = 6) or negative-control noninsulin-binding (VH281Tg, n = 6) NOD spleens stained with mAb123 or isotype control Ab (right panel). B220+ IgM+ live lymphocytes are shown. 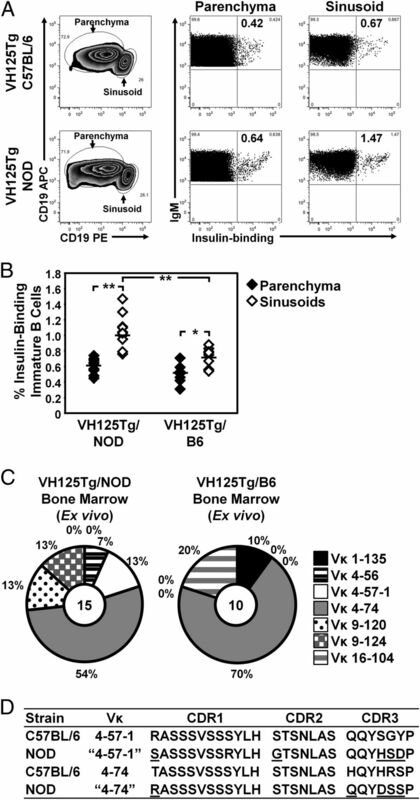 (B–D) Parenchymal (CD19-PElow) and sinusoidal (CD19-PEhigh) immature (CD19+ IgM+ CD23−) live lymphocyte–gated B cells were identified from VH125Tg or VH281Tg NOD and B6 mice using injected CD19-PE, as described in Materials and Methods. BM cells were preincubated with Fc Block prior to Ab staining (which did not alter staining profiles or anti-insulin frequencies detected, data not shown) and then stained with mAb123-biotin to detect BCRs occupied with endogenous rodent insulin and other surface marker Ab. (B) Representative plots. (C and D) Summary graphs show at least four individually plotted 10–16-wk-old mice (n = 2 experiments). Parenchymal or sinusoidal immature mAb123-stained B cells are identified as above. (C) Percentage of insulin-occupied immature B cells (mAb123+), p < 0.001 for all comparisons of VH125Tg with negative-control VH281Tg mice. (D) The mAb123 MFI of mAb123+ immature parenchymal or sinusoidal B cells is plotted to show the level of insulin occupancy on mAb123+ cells. *p < 0.05, **p < 0.01, ***p < 0.001, two-tailed t test. 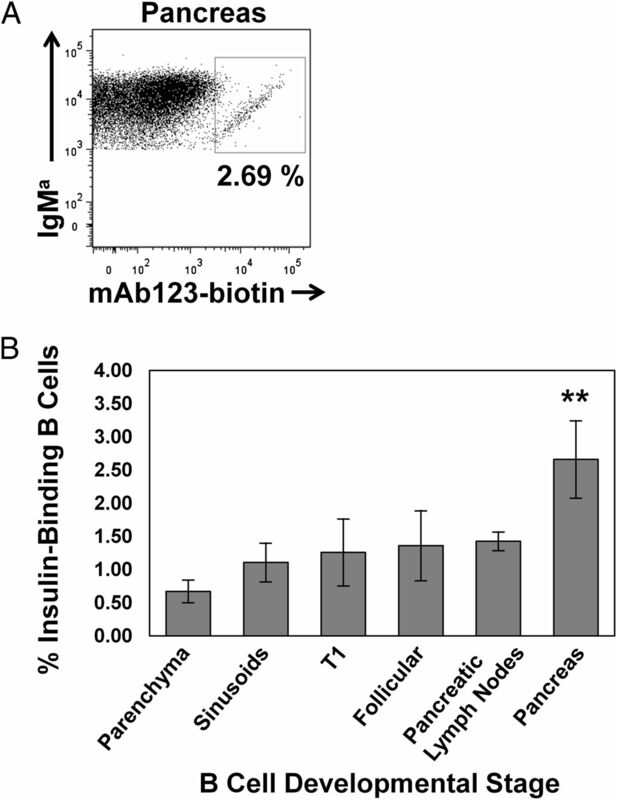 To investigate whether the degree of insulin occupancy varies with the anatomical niche or with background strain, the mAb123 mean fluorescence intensity (MFI) of mAb123+ B cells identified in Fig. 3B was compared among parenchymal and sinusoidal immature B cells of VH125Tg NOD and B6 mice. Interestingly, Fig. 3D shows that the mAb123 MFI is elevated in the sinusoids of VH125Tg/NOD mice (5630 ± 708) versus the parenchyma (3344 ± 687). In contrast, the mAb123 MFI is unchanged between the parenchyma (2397 ± 787) and sinusoids (2445 ± 161) of VH125Tg/B6 mice. Although there is no significant difference between the mAb123 MFI in the parenchyma of VH125Tg NOD and B6 mice, insulin-occupied BCRs in the sinusoids of NOD mice show a significantly higher mAb123 MFI than in B6 mice. These data show that, despite the low concentration of autoantigen present physiologically (∼1–5 ng/ml) (29), insulin occupies the BCR at the earliest detectable stage of Ag-binding commitment of anti-insulin B cells in the BM of VH125Tg mice. The blood-exposed sinusoids of VH125Tg/NOD autoimmune mice are pinpointed as the niche in which insulin-occupied immature B cells are present at higher frequency and with a higher degree of insulin occupancy compared with the nonautoimmune B6 strain. Increased levels of insulin autoantigen occupy a higher frequency of insulin-binding B cells in VH125Tg/NOD mice, compared with the nonautoimmune strain (Fig. 3). To functionally investigate whether CDR polymorphisms identified might provide an explanation for this discrepancy, hybridomas were generated from VH125Tg/NOD or VH125Tg/B6 mice 3 d following immunization with human insulin (the original mAb125 immunogen) or beef insulin that were conjugated to a T cell–independent carrier (Brucella abortus). The conjugate was shown to capture a preimmune (unmutated) repertoire for insulin (19). This approach combines potent T cell–independent immunization and enhanced fusion techniques to facilitate the capture of autoreactive B cells (19, 23). ELISA on hybridoma supernatants verified the production of anti-insulin Ab (screened against human insulin), the binding of which was inhibited by the addition of excess human insulin in solution (data not shown). The large majority of Vκ genes identified among the insulin Ab-secreting NOD hybridoma clones was Vκ4-57-1 or Vκ4-74 and germline encoded (B6 Vκ4-57-1: 9/9; B6 Vκ4-74: 29/34; NOD Vκ4-57-1: 13/15; NOD Vκ4-74: 20/25), based on comparison with published sequences (24). The self-reactive potential of the Abs was determined by measuring reactivity with both human (foreign) and rodent (self) insulin using ELISA, and an autoreactivity index was calculated (Materials and Methods). The average autoreactivity index was calculated for each individual Vκ/Jκ species, defined by different CDR amino acid sequences that arise from diverse Vκ/Jκ rearrangement. Thus, error bar variability is due to Vκ/Jκ heterogeneity, rather than assay variability; in the event of multiple identical isolates, the average was used (Fig. 4A). The autoreactivity index is graphed for each individual isolate in Fig. 4B. The autoreactivity index is significantly higher (p < 0.01) in NOD Vκ4-57-1 hybridomas compared with B6 hybridomas (Fig. 4A, 4B, left panel), but it is unchanged (p = 0.08) in NOD versus B6 Vκ4-74 hybridomas (Fig. 4A, 4B, right panel). These data show that B6 mice possess at least one endogenous L chain (Vκ4-74) that can pair with VH125 to generate an insulin autoantigen-binding BCR. Vκ polymorphisms enhance insulin autoreactivity in VH125Tg/NOD mice. VH125Tg B6 or NOD mice were immunized in a T-independent manner with heterologous insulin, and hybridomas were generated as described in Materials and Methods. Clones producing Ab reactive with human insulin were identified by ELISA. Expressed Vκ genes were cloned, sequenced, and identified using IMGT and IgBLAST, as described in Materials and Methods. Sequences were deposited into GenBank under accession numbers JQ915156–JQ915175. (A) Bar graph summary of autoreactivity index, calculated as described in Materials and Methods, of Vκ is shown (n ≥ 7 independent hybridoma isolates, *p < 0.01, as calculated by a two-tailed t test). Error bars encompass Vκ/Jκ heterogeneity, rather than assay heterogeneity (see C). (B) Autoreactivity index values for individual Vκ/Jκ species clones (represented by individual data points). Different Vκ/Jκ species harboring different CDR3 due to combinatorial and junctional diversity are indicated on the x-axis. The autoreactivity index of Vκ4-57-1 sequences was compared: B6 (filled symbols, n = 7) and NOD (open symbols, n = 7) (left panel). p < 0.01, Mann–Whitney U two-tailed test. The autoreactivity index of Vκ4-74 sequences was compared: B6 (filled symbols, n = 23) and NOD (open symbols, n = 13) (right panel). p = 0.08, Mann–Whitney U two-tailed test. (C) CDR amino acid and autoreactivity index comparison of hybridoma sequences that contain the same (upper panel) or similar (lower panel) Jκ rearrangements in CDR3 isolated from VH125Tg B6 or NOD hybridomas. (D) Vκ/Jκ CDR junction and autoreactivity index comparison of hybridoma sequences isolated from VH125Tg B6 (filled symbols) or NOD (open symbols) mice. The autoreactivity index of P-P–containing sequences (left of vertical line, n = 19) was compared with all other sequences (right of vertical line, n = 31). p < 0.001, Mann–Whitney U two-tailed test. (E) The nucleotide and amino acid sequences of Vκ4-57-1 and Vκ4-74 CDR3, along with all Jκ to indicate potential CDR3 contributions. B6 sequences are shaded in gray, NOD are not shaded. (C and E) NOD nucleotide polymorphisms and predicted amino acid changes (relative to B6) are underlined. Two Jκs (Jκ2 and Jκ4) are polymorphic in the NOD strain (Fig. 4E), clouding interpretation of the specific contribution of Vκ4-57-1 polymorphisms to autoantigen recognition; however, Jκ1 and Jκ5 are the same in the two strains. Fig. 4C shows that, in the presence of identical Jκ5 rearrangements, the autoreactivity index is increased 3-fold by the polymorphic NOD Vκ4-57-1 compared with the B6 Vκ4-57-1. Vκ125Tg (GenBank accession number M34530; http://www.ncbi.nlm.nih.gov/genbank/) is a well-characterized Vκ4-74 insulin-binding L chain that contains a Pro-Pro motif at the Vκ/Jκ join; this motif is found in other insulin-binding L chains (17, 20, 30). This Pro-Pro motif was found in B6 Vκ4-74 and NOD Vκ4-57-1 hybridomas that exhibited significantly higher insulin autoreactivity indices compared with NOD and B6 Vκ4-74 and Vκ4-57-1 Abs that did not contain this motif (Fig. 4D, p < 0.001). Pro-Pro was not found in any of the B6 Vκ4-57-1 or NOD Vκ4-74 hybridomas captured, and germline sequence analysis confirms that these L chain sequences cannot encode the Pro-Pro motif, regardless of Jκ join, because the second Pro can only be contributed by the Vκ (Fig. 4E). Of note, the more highly autoreactive NOD Vκ4-74 P-L clones possess the germline sequence, whereas those with lower autoreactivity have framework mutations but identical CDR3. These data suggest that polymorphisms in Vκ4-57-1 confer the potential for a Pro-Pro CDR3 motif that increases insulin autoreactivity in VH125Tg/NOD mice. In contrast, an opposite trend is observed for NOD Vκ4-74, in which the Pro-Pro motif potential is absent. Flow cytometry revealed the presence of insulin-binding B cells in VH125Tg/NOD mice that are occupied by insulin in the developing repertoire of the BM (Fig. 3), as well as the mature repertoire of the spleen (13, 17). Functional studies of Abs captured through hybridoma screens confirm insulin autoantigen binding specificity (Fig. 4). To assess whether these polymorphic anti-insulin Vκ are counterselected by central tolerance mechanisms aimed at developing B cells emigrating from the BM into the spleen, the insulin-binding repertoire of VH125Tg/NOD BM and spleen was compared. To ensure capture of anti-insulin B cells present in the developing repertoire in the absence of counterselection due to autoantigen engagement, VH125Tg/NOD BM cells were cultured with IL-7 in the absence of insulin (as in Fig. 1B, 1C), and anti-insulin B cells were isolated using flow cytometry sorting. Spleen B cells were purified by CD43− MACS–negative selection of the same mice. Insulin-binding B cells were sorted using FACS, and expressed Igκ genes were amplified, cloned, and sequenced. As shown in Fig. 5A, preferential usage of Vκ4-57-1 and Vκ4-74 is found in both developing (73%, 11/15 clones) and peripheral (90%, 27/30 clones) VH125Tg/NOD anti-insulin B cells, similar to what was observed in the anti-insulin repertoire of immature B cells derived from BM ex vivo (Fig. 2C). In many instances, the same CDR sequences that were captured in the insulin-binding hybridoma screen were also found among primary isolates: B6 Vκ4-57-1, 0/9; NOD Vκ4-57-1, 10/15; B6 Vκ4-74, 21/34; and NOD Vκ4-74, 23/25 (data not shown). There was no significant difference between the usage of particular insulin-binding L chains in the naive BM culture and peripheral spleen B cells, as determined by a two-sample binomial test to compare the proportions (p = 0.16). These data indicate that L chains confirmed to bind autologous insulin when paired with VH125 (Fig. 4) are eluding central tolerance checkpoints to populate the periphery of T1D-prone NOD mice. Anti-insulin Vκ are not counterselected by central tolerance checkpoints present at the developmental transition from BM to spleen. (A) Biotin-insulin was used to identify insulin-binding B cells that were purified using flow cytometry sorting of Ag-naive IL-7–cultured BM immature B cells (B220+ IgMa+ CD23+ lymphocytes), generated as described in Materials and Methods, or Ag-exposed spleen B cells (B220+ IgMa+ lymphocytes) isolated ex vivo. Expressed Vκ genes were cloned, sequenced, and identified using IMGT and IgBLAST, as described in Materials and Methods. For each Vκ isolated, the total number of clones is shown within the pie chart; the frequency is shown outside of the pie chart. Sequences were deposited into GenBank under the accession numbers indicated. IL-7–cultured BM (n = 3 VH125Tg/NOD mice, n = 3 experiments, n = 15 clones, GU179059 and KC484488-KC484501) (left panel). Ag-experienced ex vivo spleen (n = 5 VH125Tg/NOD mice, n = 4 experiments, n = 27 clones, GU179060, KC484508–KC484536) (right panel). Mice were 8–12 wk old. (B and C) Insulin-binding B cells, sorted using flow cytometry, from VH125Tg/NOD BM and spleen [(A) and Fig. 2)], were separated into low and high insulin-binding MFI populations. (C) Vκ repertoire was identified in low and high MFI populations from (B) and compared as in (A). Genbank accession numbers are as follows: “Low MFI”: GU179059, KC484488-491, KC484495, KC484499, KC484510, KC484512, KC484514, KC484515, KC484521, KC484522, KC484525, KC484529, KC484532-534, KC484537-541, and KC484546; “High MFI”: KC484494, KC484497-498, KC484500-501, KC484508-509, KC484511, KC484513, KC484516, KC484523-524, KC484526-528, KC484531, KC484536, KC484542-545, and KC484547-551. Discrete populations (diagonal binding) of anti-insulin B cells are apparent by flow cytometry in the BM and spleens of VH125Tg/NOD mice (Fig. 5B). These populations were sorted separately into low or high MFI populations based on the intensity of staining with biotinylated insulin. Expressed Vκ were isolated, cloned, and identified as above. Among the low MFI population present in BM and spleen, Vκ4-57-1 predominated (57%, 13/23 clones); among the high MFI population, Vκ4-74 was present in the majority of isolates (74%, 20/27 clones, Fig. 5C). Taken together, these data suggest that the majority of anti-insulin B cells isolated from VH125Tg/NOD mice arises from the Vκ4 family, specifically from the Vκ4-57-1 and Vκ4-74 genes, and that BCRs using these L chains are not eliminated from the repertoire through negative selection. Previous attempts failed to detect insulin-binding B cells in the pancreas of VH125Tg/NOD mice, despite identification of Vκ4-57-1 among pancreatic B cell isolates (31). The finding that VH125Tg/NOD B cells expressing Vκ4-57-1 react with autoantigen (Fig. 4) suggests that insulin-reactive B cells are present in the pancreas but have evaded detection by staining with biotinylated insulin. To assess the frequency of anti-insulin B cells that are present among pancreatic infiltrates, mAb123 was used to identify insulin-binding B cells whose BCRs may be too fully occupied with endogenous insulin to be detected through exogenous staining with biotinylated insulin. Using this method, insulin-binding B cells were detected among B220+ IgMa+ live lymphocytes in the pancreas (Fig. 6A). This frequency was compared among B cell subsets present at every developmental stage from origination in the BM to pancreas infiltration. The frequency of BCRs occupied by insulin observed in the pancreas was significantly higher than in any other subset compared (2.66 ± 0.58%, p < 0.001 for pancreas versus every other subset, Fig. 6B). These data show that anti-insulin B cells are increased in the pancreas at least ∼3–4-fold over the frequency that initially forms in the developing repertoire, suggesting that anti-insulin B cells are positively selected into the organ targeted by autoimmune destruction. Anti-insulin B cells that escape central tolerance are enriched at the site of autoimmune attack. B cells whose BCR were loaded with endogenous insulin were detected by mAb123-biotin staining within B220+ IgMa+ live lymphocytes from freshly isolated pancreata of VH125Tg/NOD mice. (A) Representative flow cytometry plot. (B) Summary bar graph (n ≥ 8). **p < 0.001 versus all other groups, two-tailed t test. Vκ repertoire analysis of VH125Tg/NOD pancreata identifies Vκ4-57-1 as 7% of the L chain repertoire based on clone frequency (31) (data not shown), a proportion consistent with flow cytometry findings (Fig. 6). CDR amino acid alignment with NOD germline reference sequences (24) shows evidence of somatic hypermutation (SHM) in VH125Tg/NOD spleen and pancreatic Vκ4-57-1 isolates; the mutated CDR amino acids are shown in Fig. 7A. Of the Vκ4-57-1 clones isolated from spleen or pancreata, 28% or 47% of clones show evidence of SHM, respectively (Fig. 7B). These data indicate that a substantial proportion of anti-insulin B cells emerging from the BM ultimately undergoes SHM. Anti-insulin B cells that escape central tolerance undergo SHM and stimulate IFN-γ production. (A) The amino acid CDR composition of mutated Vκ4-57-1 isolates from spleen, pancreatic draining lymph nodes (PLN), pancreas, and islets of VH125Tg/NOD mice. Germline amino acids are in gray type; mutated amino acids are in black type and underlined. (B) The proportion of VH125Tg/NOD Vκ4-57-1 isolates that shows germline CDR or mutated CDR is indicated for VH125TgNOD spleen (left panel) and pancreas/islets (right panel). Germline or mutated frequency is shown outside of the pie chart; the total number of clones is shown in the center. Sequences were deposited in GenBank with accession numbers JX064462–JX064465, JQ915176–JQ915195, and KC484502–KC484507. (C) Splenocytes from VH281Tg and VH125Tg NOD mice were cultured for 72–96 h in the presence or absence of human insulin, and IFN-γ responses were measured by ELISPOT (see Materials and Methods) (n ≥ 6). *p > 0.01, two-tailed t test. The presence of SHM in anti-insulin Vκ (Fig. 7A) implies autoantigen-specific T–B cell interactions in the disease process and is consistent with our recent data that show anti-insulin B cells can process and present insulin epitopes to T cells (32). We hypothesize that SHM is due to anti-insulin B cell cross-talk with cognate T cells. To investigate whether anti-insulin B cells influence the frequency or function of this important subset, splenocytes were harvested from VH125Tg/NOD or VH281Tg/NOD mice and used in ELISPOT assay to measure Th1 (IFN-γ) and Th2 (IL-4) cytokine production following insulin stimulation. Splenocytes from VH125Tg/NOD mice that harbor anti-insulin B cells show an increase in the number of IFN-γ spots in response to insulin compared with VH281Tg/NOD mice that lack detectable anti-insulin B cells (p < 0.01, Fig. 7C). Interestingly, the numbers of spontaneous IFN-γ spots also were increased in VH125Tg/NOD splenocytes at baseline (p < 0.01, Fig. 7C). In contrast, IL-4 was undetectable (data not shown). Activated Th1 cells that produce IFN-γ are associated with T1D pathogenesis (33, 34). These findings are consistent with the association of anti-insulin B cells in VH125Tg/NOD mice with acceleration of the disease process (12, 25) and further suggest that flawed central tolerance for anti-insulin B cells generates a pre-T1D environment that promotes expansion of pathogenic anti-insulin T cells. These studies highlight the BM sinusoids as the point of “original sin” for the genesis of anti-insulin B cells in T1D-prone mice. Thomas Francis (35) initially coined the term “original antigenic sin” to describe how early foreign antigenic encounter guides subsequent immune responses. Although the stages of B cell development are different, both processes govern the subsequent focus of B cell/Ab interaction with Ag. In NOD mice, we find a more pernicious source of repertoire bias, in which B lymphocytes display increased insulin autoreactivity from birth in the BM, rather than requiring subsequent affinity maturation to pose an islet threat. In addition to the higher frequency of insulin-binding B cells that form in the autoimmune strain, insulin autoantigen occupancy of cognate BCRs is higher in the BM. 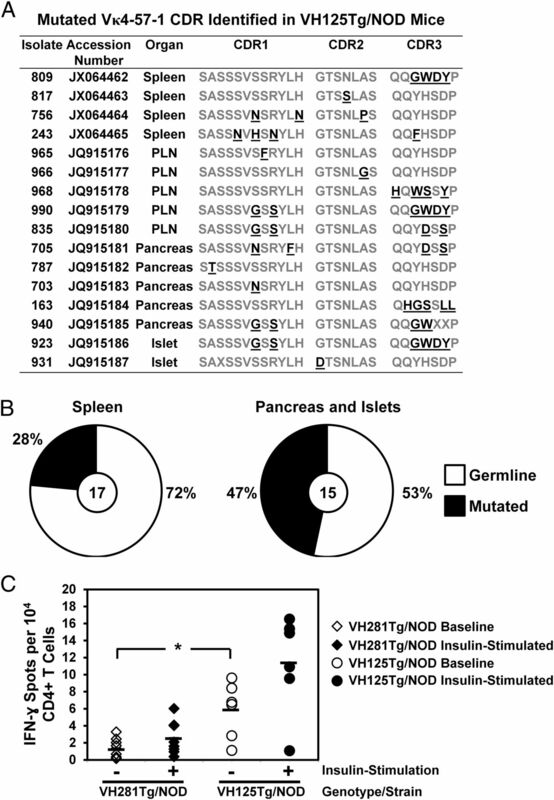 Two Vκ4 genes dominate the BM and spleen anti-insulin repertoire of NOD mice and show germline potential for insulin autoreactivity. Polymorphisms in NOD Vκ4-57-1 confer a key CDR3 motif that enhances insulin autoreactivity. The consequence of BM proclivity for insulin autoimmunity is that anti-insulin B cells transit to the periphery and are positively selected into the pancreas, where they show evidence of SHM. The presence of anti-insulin B cells in the repertoire is associated with increased production of the inflammatory cytokine IFN-γ in ELISPOT. These data suggest that the BM “original sin” seeds anti-insulin B cells into the periphery where they likely collaborate with cognate T cells to promote inflammatory attack of the pancreas. Anti-insulin B cells develop with increased frequency in VH125Tg/NOD BM (Fig. 1A), despite the identical H chain present in NOD and B6 VH125Tg mice. One potential explanation for this difference is that environmental factors in the autoimmune strain may enhance autoreactive B cell development. These could include increased survival factor availability or changes in chemokine or homing receptor expression that increase the kinetics of BM exit, limiting the window for central tolerance in the autoimmune strain. Studies on developing B cells that reach mature subsets in WT/NOD mice suggest that negative selection collapses at the transitional stage (36) and are complementary with data suggesting that similar B cell checkpoint defects underlie autoimmunity in patients (2, 3). A receptor-editing defect also was proposed for T1D mice and human patients, based on a lower observed recombining sequence rearrangement frequency (37). The current investigation clearly indicates that receptor editing is failing to eliminate insulin-binding B cells in VH125Tg/NOD mice. Future studies to directly address whether receptor-editing efficiency is altered in autoimmune mice are necessary to outline the role that this key central tolerance mechanism plays in preventing insulin autoimmunity. IL-7–driven BM culture in vitro limits the influence of environmental factors and eliminates autoantigen exposure to produce naive immature B cells (26, 27). Nonetheless, increased formation of anti-insulin B cells in the NOD strain is still observed in BM cultured in the absence of insulin in vitro (Fig. 1B, 1C). This suggests that, although central tolerance may certainly be a component of the enhanced anti-insulin B cell frequency, it is not the only contributing factor. Vκ polymorphisms alter CDR in the NOD strain (24) and offer one potential explanation for enhanced formation of autoreactive B cells. Two polymorphic Vκ4 family members, Vκ4-57-1 and Vκ4-74, dominate the insulin-binding repertoire in VH125Tg/NOD mice (Figs. 2, 5). The nucleotide changes in the Vκ sequences are of germline origin and do not arise from SHM, based on comparison with published NOD germline sequences (24). Binding studies confirm that even when the Jκ contribution is the same, Vκ4-57-1 polymorphisms enhance insulin autoantigen recognition in VH125Tg/NOD mice (Fig. 4). A CDR3 Pro-Pro motif was identified in several anti-insulin Vκ (20). 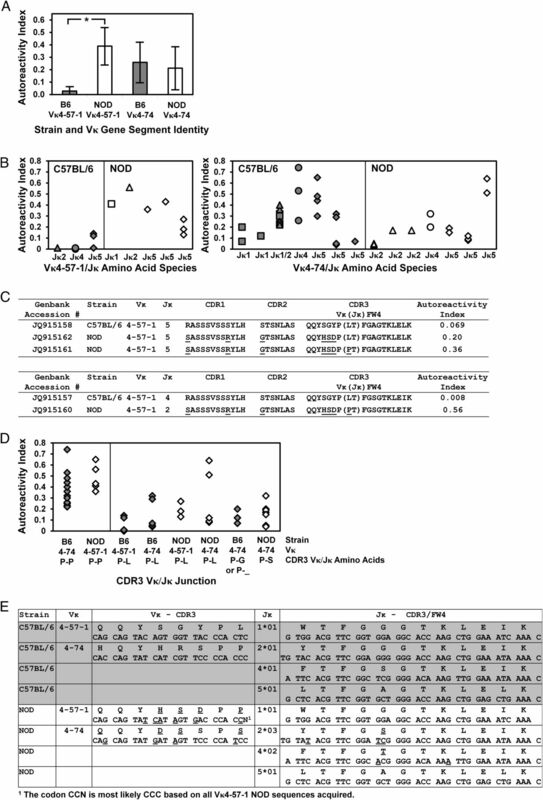 These studies show that Vκ4-57-1 polymorphisms in CDR3 confer the potential for generation of this motif, which is shown to enhance insulin autoantigen recognition (Fig. 4). The serine-rich CDR1 of both Vκ4-57-1 and Vκ4-74 is found among other anti-insulin mAb (20, 38). This motif is reminiscent of that found in the insulin receptor ligand–binding domain and, thus, is a likely contributor to Ag binding. Similar Vκ4 genes are also found in autoreactive Abs derived from insulin immunization in combination with different VH, suggesting that this structure may predispose toward insulin recognition (20, 38, 39). Because the polymorphisms present in NOD Vκ are shared among other systemic lupus erythematosus–prone autoimmune strains (24), and because other anti-insulin autoantibodies characterized from NOD mice showed cross-reactivity with other self-Ags, such as DNA, thyroglobulin, IgG, and cardiolipin (39), we speculate that polymorphic Vκ may also enhance the recognition of other autoantigens. The α-chain of the TCR is the structural correlate to the L chain of the BCR. Interestingly, a polymorphic TCRα-chain also contributes to the formation of TCRs on pathological anti-insulin T cells in NOD mice (40, 41). Polymorphic Vκ are not the only explanation for the higher frequency of insulin-binding B cells generated in the NOD strain, because Vκ4-74 shows potential for autoreactivity in both strains. Differences in regulatory elements that control Vκ usage may also exist between strains. Central and peripheral tolerance may also be differentially applied, in addition to any repertoire bias in the autoimmune strain. Some anti-insulin mAbs that recognize human insulin do not bind rodent insulin (Fig. 4). This suggests that a fraction of the cells identified by biotinylated human insulin staining may be clonally ignorant. However, it is clear that a proportion of anti-insulin B cells have autoantigen-occupied BCRs when Ag specificity is first acquired in the BM parenchyma (Fig. 3); this frequency is increased in the sinusoids of the NOD strain compared with B6 VH125Tg mice. The increased frequency of insulin-binding B cells observed in the sinusoids compared with the parenchyma suggests that positive selection may be occurring (Figs. 2, 3). An alternative explanation is that receptor editing prolongs the time that anti-insulin B cells spend in the sinusoids, thus increasing the frequency; however, because the anti-insulin B cell percentage in the sinusoids is similar to that observed in transitional and subsequent mature B cell compartments, it is unlikely that receptor editing is culling a major fraction of anti-insulin B cells in VH125Tg/NOD mice. Naive immature anti-insulin B cells can sense insulin and show signs of anergy induction following autoantigen exposure, supporting the ability of insulin to interact with the BCR in a perceptible way (26). A higher level of BCR occupancy with insulin autoantigen is first observed in this blood-exposed BM niche in VH125Tg/NOD mice (Fig. 3). We speculate that this may be due to a higher average affinity of BCR for endogenous insulin in VH125Tg/NOD mice compared with the nonautoimmune strain. Insulin-occupied BCRs are also clearly observed in VH125Tg/NOD mature peripheral B cell subsets (13); thus, clonal ignorance fails to explain the escape of anti-insulin B cells to the periphery of NOD mice. If anergy is being applied in this model, it certainly does not sufficiently limit the competitive survival of anti-insulin B cells to prevent their infiltration of the pancreas (Fig. 6). Tracking Vκ usage by anti-insulin B cells in the BM and periphery documents a direct connection between the two compartments (Fig. 5). This identifies BM genesis, rather than peripheral selection of a rare specificity, as the key factor that contributes to autoreactive B cell presence in the mature repertoire. Notably, the Vκ4-57-1 L chain identified in the BM and spleen that was confirmed to be insulin reactive (Fig. 4) is also found among B cells infiltrating the pancreas of VH125Tg/NOD mice (31). Anti-insulin B lymphocytes exit the BM and infiltrate the pancreas with 3–4-fold increased frequency (Fig. 6). Insulin-reactive B cells that escape from the BM can impact the invading repertoire of the pancreas. Vκ1-110, Vκ9-120, and Vκ9-124 were also observed in a minor fraction of insulin-binding B cells isolated from BM and spleen. These L chains also were isolated from other anti-insulin B cell screens (16), as well as from the pancreas, the site of autoimmune destruction (31) (data not shown); however, functional studies are required to confirm their specificity for insulin. Flow cytometry identifies two distinct insulin-binding populations in the BM and spleen (Fig. 5); however, only one is apparent in the pancreas (Fig. 6). Interestingly, the Vκ4-74 L chain was not observed in the pancreas of VH125Tg/NOD mice (31), despite its ability to bind insulin autoantigen (Fig. 4). One explanation is that Vκ4-57-1 may have higher affinity for autoantigen and, thus, is more heavily selected into the site of autoimmune attack. In support of this, the autoreactivity index is higher, on average, for Vκ4-57-1 than for Vκ4-74, suggesting that Vκ4-57-1 more efficiently binds rodent (self) insulin (Fig. 4). Biotinylated insulin staining is impaired by higher BCR occupancy with endogenous insulin in the pancreas of VH125Tg/NOD mice (31) (Fig. 6). 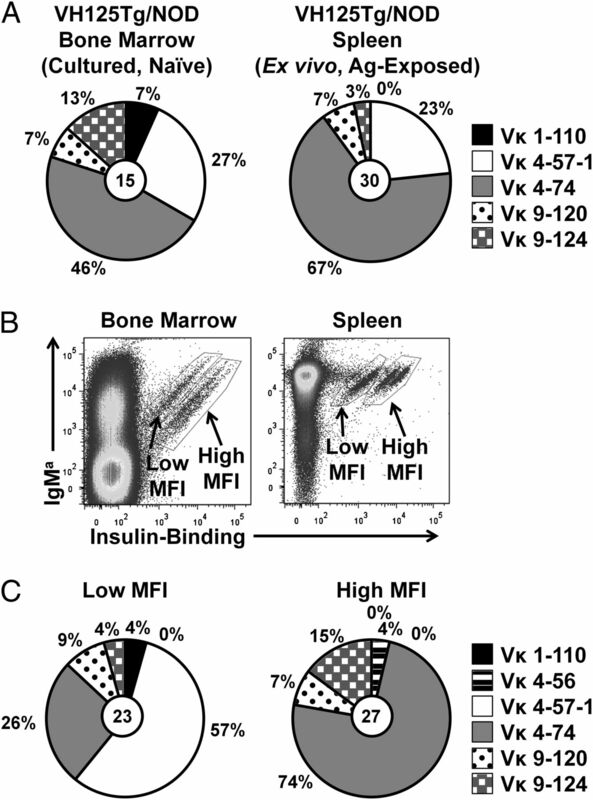 Of the two insulin-binding populations observed in BM and spleens, Vκ4-57-1 is associated primarily with the population that shows lower biotinylated-insulin MFI (Fig. 5). Therefore, we propose that Vκ4-57-1 has higher endogenous Ag affinity (and thus higher occupancy) due to unique polymorphisms, which may lead to its selection into the pancreas. It is clear that many Vκ4-57-1+ B cells have undergone SHM (Fig. 7A, 7B) (31). Tertiary lymphoid structures with germinal centers are observed to form in the pancreas, and it was proposed that SHM occurs at the site of autoimmune attack (31). Further work is required to determine how SHM impacts the disease process. Regardless of when SHM initiates, productive B lymphocyte collaboration with T cells is also suggested by increased IFN-γ production in the spleens of VH125Tg/NOD, but not VH281Tg/NOD, mice, in which insulin-binding B cells are present or absent, respectively (Fig. 7C). This is further supported by the finding that anti-insulin B cells can present Ag to cognate T cells isolated from NOD mice (32). Therefore, we favor the hypothesis that enhanced IFN-γ production results from Ag-specific T cells activated by anti-insulin B cells in vivo. The production of IFN-γ, but not IL-4, is consistent with Th1 cell activation, which is known to mediate the islet inflammatory process in T1D (33, 34). Therefore, these data serve as indirect evidence that anti-insulin B cells are presenting Ag to insulin-reactive Th1 CD4+ T cells to stimulate their production of IFN-γ within a polyclonal repertoire and suggest inflammatory consequences of anti-insulin B cell escape through tolerance checkpoints. Based on these findings, we propose the following model. Anti-insulin B cells form with increased frequency in the BM of autoimmune VH125Tg mice, which is first apparent in the BM sinusoids. Polymorphisms that alter CDR composition enhance self-reactivity for insulin in VH125Tg/NOD mice. Despite autoantigen encounter as early as Ag commitment in the BM parenchyma, insulin autoreactive B cells escape into the periphery of the autoimmune strain in the absence of detectable negative selection. Anti-insulin B cells interact with anti-insulin T cells to drive islet-directed inflammation and are enriched in the pancreas, the site of autoimmune attack. Thus, the BM is identified as the point of “original sin,” from which dangerous autoimmunity first arises in the B cell repertoire that leads to the peripheral consequence of islet attack. We thank James B. Case, Chrys Hulbert, Allison M. Sullivan, Emily J. Woodward, and Guowu Yu for technical support (Vanderbilt University), as well as the Vanderbilt Medical Center Flow Cytometry Shared Resource and the Vanderbilt Digestive Disease Research Center, the Vanderbilt DNA Sequencing Facility, the Vanderbilt Antibody and Protein Resource, the Vanderbilt Hormone Assay and Analytical Services Core, and the Vanderbilt Diabetes Research and Training Center. We also thank Dr. Betty Diamond for kindly providing the NSO-BCL2 myeloma line. This work was supported by National Institutes of Health Grants 5T32-HL069765, 5T32-AR059039, R01-AI051448, R01 DK084246, and K08 DK070924 and was supported by the following Vanderbilt University Medical Center core facilities: the Vanderbilt Medical Center Flow Cytometry Shared Resource (supported by the Vanderbilt Ingram Cancer Center [P30 CA68485] and the Vanderbilt Digestive Disease Research Center [DK058404]), the Vanderbilt DNA Sequencing Facility (supported by the Vanderbilt Ingram Cancer Center [P30 CA68485], the Vanderbilt Vision Center [P30 EY08126], and the National Institutes of Health/National Center for Research Resources [G20 RR030956]), and the Vanderbilt Diabetes Research and Training Center (DK20593). The sequences presented in this article have been submitted to GenBank (http://www/ncbi.nlm.nih.gov/genbank/) under accession numbers JQ915156–JQ915195, JX064462–JX064465, and KC484488–KC484561.
. 2003. Predominant autoantibody production by early human B cell precursors. Science 301: 1374–1377.
. 2005. Defective B cell tolerance checkpoints in systemic lupus erythematosus. J. Exp. Med. 201: 703–711.
. 2005. Impaired early B cell tolerance in patients with rheumatoid arthritis. J. Exp. Med. 201: 1659–1667.
. 2011. The PTPN22 allele encoding an R620W variant interferes with the removal of developing autoreactive B cells in humans. J. Clin. Invest. 121: 3635–3644.
. 2004. Receptor editing is the main mechanism of B cell tolerance toward membrane antigens. Nat. Immunol. 5: 645–650.
. 2009. Cannabinoid receptor 2 mediates the retention of immature B cells in bone marrow sinusoids. Nat. Immunol. 10: 403–411.
. 2010. S1P3 confers differential S1P-induced migration by autoreactive and non-autoreactive immature B cells and is required for normal B-cell development. Eur. J. Immunol. 40: 688–698.
. 1983. Insulin antibodies in insulin-dependent diabetics before insulin treatment. Science 222: 1337–1339.
. 2000. Early expression of antiinsulin autoantibodies of humans and the NOD mouse: evidence for early determination of subsequent diabetes. Proc. Natl. Acad. Sci. USA 97: 1701–1706.
. 2011. Age of islet autoantibody appearance and mean levels of insulin, but not GAD or IA-2 autoantibodies, predict age of diagnosis of type 1 diabetes: diabetes autoimmunity study in the young. Diabetes Care 34: 1397–1399.
. 2005. Prime role for an insulin epitope in the development of type 1 diabetes in NOD mice. Nature 435: 220–223.
. 2001. B cell specificity contributes to the outcome of diabetes in nonobese diabetic mice. J. Immunol. 167: 5535–5538.
. 2012. Autoantigen-specific B-cell depletion overcomes failed immune tolerance in type 1 diabetes. Diabetes 61: 2037–2044.
. 1994. Competition for follicular niches excludes self-reactive cells from the recirculating B-cell repertoire. Nature 371: 389–395.
. 1999. Follicular exclusion and rapid elimination of hen egg lysozyme autoantigen-binding B cells are dependent on competitor B cells, but not on T cells. J. Immunol. 162: 284–291.
. 2005. Multiple germline kappa light chains generate anti-insulin B cells in nonobese diabetic mice. J. Immunol. 175: 1073–1079.
. 2001. Anergy and not clonal ignorance determines the fate of B cells that recognize a physiological autoantigen. J. Immunol. 166: 3194–3200.
. 1984. Binding of insulin to its receptor impairs recognition by monoclonal anti-insulin antibodies. Diabetes 33: 778–784.
. 1997. T cell-independent response to Brucella-insulin identifies a preimmune repertoire for insulin. J. Immunol. 159: 2334–2341.
. 1990. VH and VL gene usage by murine IgG antibodies that bind autologous insulin. J. Immunol. 144: 3091–3098.
. 1983. Mapping epitopes on the insulin molecule using monoclonal antibodies. Eur. J. Immunol. 13: 693–700.
. 1995. VH gene structure predicts a large potential anti-insulin repertoire. Mol. Immunol. 32: 311–321.
. 1996. Pathogenic autoantibodies are routinely generated during the response to foreign antigen: a paradigm for autoimmune disease. Proc. Natl. Acad. Sci. USA 93: 2019–2024.
. 2010. Vkappa polymorphisms in NOD mice are spread throughout the entire immunoglobulin kappa locus and are shared by other autoimmune strains. Immunogenetics 62: 507–520.
. 2009. Reduced diabetes in btk-deficient nonobese diabetic mice and restoration of diabetes with provision of an anti-insulin IgH chain transgene. J. Immunol. 183: 6403–6412.
. 2009. Functional silencing is initiated and maintained in immature anti-insulin B cells. J. Immunol. 182: 3432–3439.
. 2004. IL-7 does not prevent pro-B/pre-B cell maturation to the immature/sIgM(+) stage. Eur. J. Immunol. 34: 2647–2655.
. 1984. Genesis of B lymphocytes in the bone marrow: extravascular and intravascular localization of surface IgM-bearing cells in mouse bone marrow detected by electron-microscope radioautography after in vivo perfusion of 125I anti-IgM antibody. Am. J. Anat. 170: 349–365. 1983. Physiologic action of insulin. In Diabetes Mellitus: Theory and Practice. Ellenberg M., H. Rifkin, eds. Medical Examination Publishing, New Hyde Park, NY, p. 77–88.
. 2005. Uncoupling of anergy from developmental arrest in anti-insulin B cells supports the development of autoimmune diabetes. J. Immunol. 174: 827–833.
. 2007. Tertiary lymphoid structures in the pancreas promote selection of B lymphocytes in autoimmune diabetes. J. Immunol. 178: 5643–5651.
. 2013. Tolerant anti-insulin B Cells are effective APCs. J. Immunol. 190: 2519–2526.
. 1995. In vivo activity and in vitro specificity of CD4+ Th1 and Th2 cells derived from the spleens of diabetic NOD mice. J. Clin. Invest. 95: 2979–2985.
. 1995. Interferon expression in the pancreases of patients with type I diabetes. Diabetes 44: 658–664. 1953. Influenza: the new acquayantance. Ann. Intern. Med. 39: 203–221.
. 2006. Cutting edge: impaired transitional B cell production and selection in the nonobese diabetic mouse. J. Immunol. 176: 7159–7164.
. 2008. RS rearrangement frequency as a marker of receptor editing in lupus and type 1 diabetes. J. Exp. Med. 205: 2985–2994.
. 1997. Restricted V gene repertoire in the secondary response to insulin in young BALB/c mice. J. Immunol. 158: 4292–4300.
. 2002. The natural autoantibody repertoire of nonobese diabetic mice is highly active. J. Immunol. 169: 6617–6624.
. 1997. T cell receptor restriction of diabetogenic autoimmune NOD T cells. Proc. Natl. Acad. Sci. USA 94: 2518–2521.
. 1997. T cell receptor gene polymorphisms associated with anti-insulin, autoimmune T cells in diabetes-prone NOD mice. J. Autoimmun. 10: 317–321.